I went back and ran some numbers. It's June 2nd, which means that to-date we have been in Japan for 313 days. We just bought our tickets home too, and will be flying out of Japan on July 28th (to Bangkok, and then from Bangkok to San Antonio on August 5th), meaning we only have 56 days left in Japan - less than two months! Now that time is really starting to wind down, I thought I would do an in-depth post about my thoughts on our placement in Oshima. 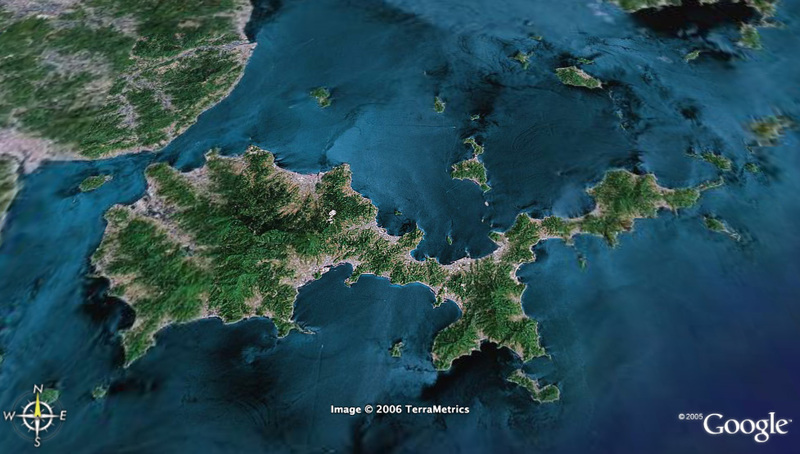 This is a follow up to my previous (and more general) post on Yamaguchi Prefecture. I apologize for the length, this is definitely my longest post to-date! "It was the best of times, it was the worst of times..." The intended use of this quotation within the context of its book is completely missing here, but I feel the quote sums up how Michelle and I feel about our year living in Oshima. Living here has been both amazing and amazingly difficult. Oshima is beautiful. Quite possibly the most beautiful place in Yamaguchi Prefecture. The island's beauty seems to be matched only by its isolation. Oshima is an island in the inland sea located in the south-west corner of Yamaguchi Prefecture. There are four towns on Oshima: Oshima, Kuka, Towa and Agenosho. The four of them were incorporated a couple years back into the one town of Suo-Oshima. In total 20,000 people live on the island. Michelle and I live in Agenosho, which has a population of about 3,000 people. Oshima and the locations of the four major towns. We live in Agenosho. The first thing that needs to be said is that Oshima has truly some of the most beautiful and breathtaking views of nature I have ever seen. On a clear day, one can peer miles across the Inland Sea to take in seemingly hundreds of small, uninhabited islands that sprout out from the smooth blue glass. The great shadows of Shikoku's distant mountains are visible in the foreground and look as if a painter brought them into being with a masterstroke of his brush. The ominous and solemn Dake-San (Mount Dake) sits directly adjacent to our town, overlooking it like a sentinel. There have been many days that I have been simply awe-struck as I walked to and from school by the sheer beauty and magnitude of the island's nature. I don't know if we could have been placed in a more beautiful spot if we had tried. The town of Agenosho a couple hours before a big rainstorm. The mountain at the center of the photo is Mount Dake. Unfortunately, Oshima is like most islands in the inland sea. It barely survives off the proceeds of a dying fishing industry and the pension checks of its senior citizens. The island's population has been shrinking for years. There used to be four public high schools on the island, but within the last 15 years all have shut down except for the one I work at, Suo Oshima Senior High School, which is located right by my apartment in Agenosho. There are very few people living on the island who are between 18 and 35 years of age. After high school people seem to bolt at their first opportunity. As a result, the percentage of Oshima's population that are senior citizens is shockingly high. As for Agenosho, the town consists of one main street that has a bunch of small residential roads that tie into it. The main street itself is stocked with a number of liqueur and clothing stores, but we have rarely seen anyone shopping in them. We truly have no idea how they stay in business. Our town market is really nice and quaint, but is only open until 6pm each day, and closed on Sundays. We do at least have some really nice "hole-in-the-wall" restaurants that serve some good local fare and ooze atmosphere, even if there hours aren't the best. Oshima is actually quite large, and logistics have been one of our biggest issues here. Agenosho is a full 30 minute drive (with no traffic) and 45 minute drive (with traffic) to the Oshima Bridge, which connects Oshima to the very small town of Obatake on the mainland of Yamaguchi Prefecture. Our closest train station is here at Obatake. From here though, it's still another 15 minute drive to the city of Yanai, which is the only halfway real "city" that we have close by. Any trip into Yanai takes a total of two hours round trip of driving! This makes it hard to leave the island on a weekday, as the two hour drive can really become a beat down. Especially since Michelle already has to make the trip every Tuesday, Wednesday and Thursday for her job in Tabuse, a small town past Yanai. Overall, I think living in such a rural place has been a positive experience. My city life in Texas was way too frantic. Between working overtime and having constant email and internet access on my phone and computer, my attention was always diverted by an endless river of distractions. I didn't know how to slow down. Living on Oshima has forced me to do that. After work, Michelle and I take walks through the quite back streets and stroll along the Agenosho's rocky shore line. We relax in the nearby onsen and climb up the nearby mountains. It has been an incredible escape from the confines of city life. I need to make sure I remember this lesson and maintain some balance when I return to the States. On the other hand, "Island Fever" is as real as the flu or the common cold. Some nights I would have sworn that we weren't living in Japan but some tiny speck of an island in Micronesia, thousands of miles away from everyone and everything that we had ever known (which I guess we still were...). Obviously being in Japan, every JET has to deal with feelings of isolation. Oshima certainly didn't lend any favors though. If we are lonely in the evening, there isn't any store, restaurant or coffee shop that we can go to and kill time at. If it's 7pm or later, making the three hour commitment to go back and forth to Yanai to do something is not feasible either. We have tried to deal the best we can. We both have torn through a ridiculous amount of books - about thirty each (and counting). Even still, there have been many times, especially in winter, that the isolation and loneliness that Michelle and I have felt has been palpable. Our friendships, both with Tiffany, the other JET from Hawaii that lived 20 minutes away in Towa, and with our neighbors and other ALTs, are really what have helped us make it through. As amazing as this last year has been, it has been anything but easy. Now that Michelle and I are emerging from the opposite side and looking back, we are starting to realize what we have accomplished. If given the opportunity at any point during the year, I'm pretty sure we both would have jumped at any possibility of getting closer to a big city on the mainland. Maybe it was better that we didn't though. Not only would we have missed out on the island's stunning beauty, but for the first time in our lives we were literally forced to slow down a little. In March and April we went back and forth on if we should of stayed a second year here, but now that we are getting closer to leaving we both know without a doubt we made the right decision. We are excited to move on to the next step in our lives. We will never forget though the memories that we made here on this tiny island in the Inland Sea. Not sure if you read the comments. But my bf, just got a notice that he will be your replacement. I am his gf. And I have a few questions for you. If you could email me at fowlerdk@gmail.com I would really appreciate it.